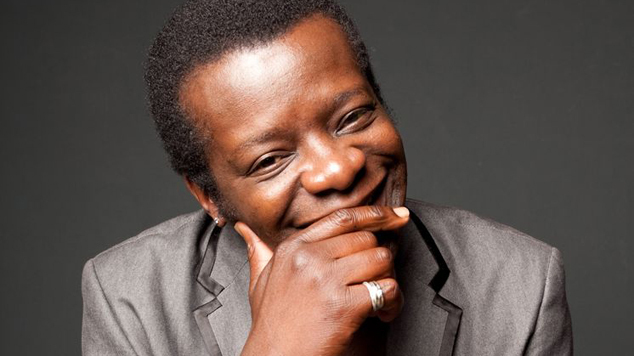 Stephen K Amos is currently touring the UK with his new show, Laughter Master, having recently come back from the USA and Australia including a appearance at Sydney Opera House. Radio Teesdale’s Peter Dixon talks to Stephen about his career and the tour. I know you’ve been working on your new show for a while. You did the Edinburgh Festival and a tour to Australia as well, and you even played the Sydney Opera House. So how was that? That was quite amazing. We love Edinburgh, I’ve been going up there for many, many years now and it’s arguably the best and the biggest arts festival in the world, not just for comedy but for theatre and music. And then to finish up there and then do a week or so in America and then go to Australia for a seven-week run, was incredible, having the joy of playing one of the most iconic buildings in the world and experiencing their sun beginning to come through as they head into their summer time and arriving back in London a couple of weeks ago just in time for our winter, great! I imagine there was lots of selfies, was there, with you and the Sydney Opera House in the background? Well it’s funny you mentioned, when you were talking about the Edinburgh Festival there, the theatre that’s on. Of course, one of the things that you’ve done for many a year is, as well as doing your stand-up show, you have done a number of acting roles. And I had the great pleasure of seeing you, in fact, in ‘On Flew Over the Cuckoo’s Nest’. Can you tell us about that and just how you get involved in those things. Is it because you can’t say no or do you just like to keep busy or what? Well to be honest it’s great to be asked to take part in things like that. And with Edinburgh, because you’re there for a whole month, I try and keep the whole day busy with doing stuff, like this year we did a talk show in the afternoon and, of course, did the late show and then lots of other bits and pieces around the town. The opportunity came along of doing ‘One Flew Over the Cuckoo’s Nest’, which was something that I could not turn down. You know, when you have someone like Christian Slater heading the cast and Frances Barber, Mackenzie Crook, Phil Nichol, and it was such a joyous thing to be a part of. I mean, who could have thought, little old me doing jokes, and they said would I become involved in the West End transfer of this show. And originally I said, no, I don’t really want to do this, I don’t want to go into the West End of London and do somebody else’s words and script. And all my friends said, “Are you insane?” They said, do you know how many actors would give their right arm to be in the West End? And it was one of the most rewarding experiences that I’ve ever encountered. I became a West End diva, I have to be honest. I did inform my friends of all the things you need to do for first night, so I got more flowers than anybody else, lots of best wishes cards adorning the dressing room. And it was really nice to be able to be in a theatre and see how that works with the stage manager, the assistant stage manager, the production manager. And I remember two nights in particular where it was so intense in the theatre that both the lead actors got nosebleeds. Just for their intense performance. It was incredible to see. And it was an absolutely wonderful show, wasn’t it? A great theatre production. I know and it’s very rare, as you probably know, to do that thing of getting something that’s such an iconic movie and then to stage it as a stage production all these years later. Jack Nicholson made the role his own as the lead character. And all the other elements within the show which are designed to make it run and tell the story and then there’s lots of pathos and then there’s tragedy as well. Oh my goodness, it was. And also you learn, you learn so much more when you think you’re doing a character correctly and then literally a month later you find something else and that just brings another dimension to the role. Did it help you kind of inform your stand-up work as well? Did it make you approach comedy differently in any way having done all that? It did, it did, actually. What we did as well, because of the subject matter of the play, we did about six or seven late-night stand-up shows with the cast from the play. And the money was raised for the charity. And because my character and another character, we had the opening lines in the piece, that gave me a kind of stillness because normally if you go on stage as a stand-up, you want to run out there and get the audience quickly. But with the play, you just have to rely on the text and performance and people will come to you. So that’s what I kind of learned from that, that you don’t have to be so phonetic and so energetic on stage, you can have a calmness and a stillness where the audience literally come into your world. On your flyer it lists some fantastic reviews. I wondered whether you personally took much notice of that, or do you, like a lot of actors do, just leave everything until you’ve finished the tour and then maybe then have a look at things? That’s personally what I would do, the latter, because I think if you are so obsessed with getting a good review or a notice, to use showbiz theatre speak, then you can just beat yourself up because, you know, people have different things that they’re looking for. My whole ethos is that you do a show, I know when I’ve done a good show, I can tell by the audience reaction and what’s happened. And I know the elements that are needed for the show to be great. If I take one person’s opinion then, and it’s a positive opinion, then why shouldn’t I take someone’s negative opinion. So what I do is I don’t read reviews because comedy is very subjective and there are lots of different styles of comedy out there. My reviewers are the people who come and see me and they laugh, if they’re not laughing then I’m not doing the job correctly. If they’re not engaged, I’m not doing the job correctly. And yes, it’s always nice to have people saying nice things about you, but I don’t get lost in that world at all. And when you’re doing a show and promoting the show, those kinds of things are helpful in terms of letting people know what the show’s about. What was the thinking about the poster for the current tour? You are stood looking at the person reading it. And there are wonderful colours and like bubbles in the background. Yeah, it’s because of the stillness. I had a poster a few years ago for a show called ‘All of Me’. And it was basically, I was going to bare all, a lot of personal stuff in that show. So the poster was me sitting naked across a sofa. So in my mind that was a metaphor and that kind of worked quite well because my head was back and I was laughing manically and that kind of made sense. So this show, I’m very much in reflective mode. That’s why you get the bubbles and the colours and I’m sort of standing still with a wry sort of smile on my face. So that was where that came from. Now, a question that I’m sure you’ve been asked 100s of times but we’ll kind of put a slight twist on it. Your stage name is Stephen K Amos, and I know that the K is a real middle name, and it has a very interesting meaning. So, what is your middle name, what does it mean and why did you feel you needed to use it as part of your stage name? Back in the day, as you had to join the Actors’ Union, you couldn’t have the same as another actor or whatever, and it’s part of me. And I did a show, again, a few years ago, in fact the radio show was called, ‘What Does the K Stand For?’ And so the K is from my parents’ backgrounds, which is my background which, is Nigeria and it’s sort of the Yoruba tribe and it means the second-born of twins. So if you’re a boy or a girl and you’re the second born, you’re always called Kehinde. And so I didn’t want to let that go as it’s something historical for me, and also my twin sister is one of my best friends on the planet. So we’ve kind of homaged to them, my family, acknowledging where I’ve come from. And I knew at some point I was going to do a show talking about it and it’s quite interesting I think. So, yes, my sister is six minutes older than me and she’ll never let me forget that. I know you come from a big family. Is there a lot of humour in your family, and are any of the other guys funny people as well? Do you know, a lot of them are funny but would never dream of going on stage and doing it. And I’ve got so many other friends of mine who are really funny people that the thought of standing up in front of a room full of strangers fills them with dread. So I’m quite lucky that I don’t have anyone in my family who is my competitor because having come from the same family we’d probably have very similar stories. And I really want my stories and my take on it to be the correct and only version that’s out there. So, yes, they’re very much sort of academic and scientific, if anything, and I was the clown of the household. So when they come along do they give you notes at the end of the session then and say, well you should have done it this way or that wasn’t really true? Yes, a few of them have come to the radio recordings and they’ve literally gone, it didn’t happen like that. And I’m like, well you know, I have taken some comedic licence on this and it’s my version. So, yes, but we don’t argue. But I don’t really put too much about the others in it because they didn’t sign up to be comedians or entertainers, so I think it’s really a bit unfair to put too much baggage on them. That’s right, yes. And, of course, you’ve written a biography as well haven’t you? So I guess you have to think of those things as you are doing that. Absolutely, yes. The book is called, ‘I Used to Say My Mother Was Shirley Bassey’. And again, the only concession I think I made was I did tell all of my siblings that I was writing this book and so I did change a few things. I think, for example, I hadn’t used any of their real names and I hadn’t gone into too much detail about what they do and who they are really. Well finally then, Stephen, you’re obviously working on this tour at the moment. What are the plans for 2016? Oh right. Well we have another radio series that we’re working on at the moment which is lovely. One of the former radio series, we’re in talks to discuss about transferring that to television. I’ve also got plans to continue this tour maybe in the autumn next year, after I’ve come back from America and Australia. So we’ve booked quite a way ahead in advance. You can listen to the audio of this interview on the Radio Teesdale website.